Once upon a time, many, many years ago, a poet friend stood on a beach at Byron Bay and, gazing wistfully out to sea remarked “this is as close as I can get to the New York poets without leaving Australia”. Looking back I wonder if, technically they were correct. Would you be closer to the New York School if you stood at the top of Cape York, or Lord Howe Island, or even Sydney in 1968? At the time, however, it seemed strangely appropriate to think that we were closer to the centre of things balanced, as we were, on the very edge of Australia. Of course such seriousness did not last long. I believe the next comment had something to do with Frank O’Hara being run over on a beach and noticing some ominous tyre tracks leading down from the dunes. This was well before the event of the Byron Bay Bluesfest, or the Byron Bay Writers Festival, but there was still a lot of creativity happening in and out of town, in cafes, bars and parks. In those days the trains still ran through to Murwillumbah and I have a distant memory of a poetry reading on the station platform. But Byron Bay, like the rest of us, has grown up at least a little and, while there may still be vibrancy on the streets, most of the cafes are now upmarket and poetry and writing a little harder to find. That is until the annual Byron Bay Writers Festival comes around. This year marks the 19th year of the festival which is held in the Arts & Industrial Estate (turn left as you head towards Byron along Ewingsdale Rd after turning off the Pacific Highway (is the upgrade finished yet?). The Festival proper kicks off this Friday (5th August) but some events are already under way. A series of workshops, run by Moya Sayer-Jones, Zanni Louise, Mandy Nolan, and Krissy Kneen among others will run at various locations around Byron in the 4 days leading up to the festival. 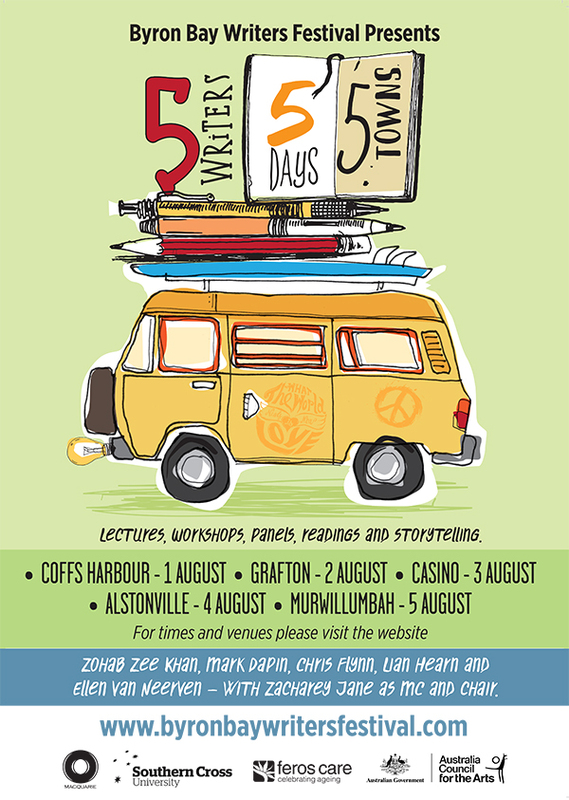 The Five Writers Road Trip (5 Writers, 5 Towns in 5 days) kicked off on 1 August in Coffs Harbour before moving to Grafton on 2 August, Casino on the 3rd, Astonville on the 4th before finishing up at Murwillumbah on the 5th. The five writers undertaking the tour are Lian Hearn, Zohab Zee Khan, Ellen van Neerven, Mark Dapin and Chris Flynn who conduct workshops and discuss books and reading during panel discussions at each stop. These days, of course, the prestige of a Writers Festival depends on their guest list, the balance between international and local names, established and emerging and so on. After Sharon Olds recently made the trip to Mildura it was with some interest to see who was making the trip to Byron Bay in Early August. I shouldn’t have been worried because, despite a handful of last minute cancellations (Helen Garner, Joanna Rakoff and Osamah Sami), there is an impressive line up of local and international talent at this years festival. One particular highlight for me would have to be British-Pakistani Political commentator Tariq Ali in conversation with Kerry O’Brien (Bush in Babylon must have one of the best cover designs of the last two decades). For the more literary minded other international guest include the 2015 Booker longlisted Nigerian writer Chigozie Obioma and the Mexican-based writer, Jennifer Clement, whose novel, Prayers for the Stolen, was shortlisted for this year’s PEN Faulkner Award for Fiction. For the local writers Kate Grenville speaking on her most recent book, One Life: My Mother’s Story, on Saturday at Byron Bay Library would have to be high on the list of must sees. I saw Kate speak on One Life at the Sydney Writers Festival this year and I can tell you you are in for a treat. The tribute to poet, guitarist, singer, composer and performance artist Daevid Allen on Saturday at the Lone Goat Gallery is also something to pencil in. Allen, who died in March this year, founded the band Soft Machine (named after a William S. Burroughs novel) in the 1960’s and took part in the 1968 Paris uprising where he apparently handed out teddy bears to police. After touring and performing and living in a hippy commune Allen returned to Australia in 1981 he returned to Australia and took up residence in Byron Bay. He continued to work on performance pieces and poetry as well performing Jazz, Acid and psychedelic rock as well as a genre called space rock. His official website can be found at http://www.daevidallen.net/daevidallen/ index.html. 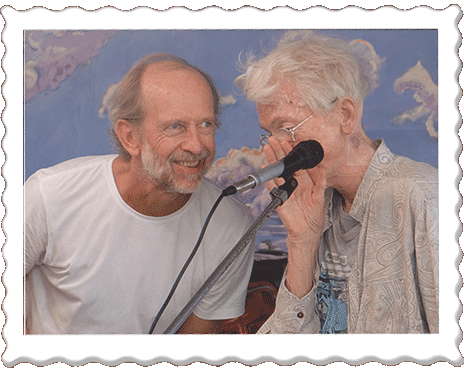 The tribute to Allen will be MCed by poet David Hallett who organised Allen’s last public reading in Byron Bay on 1st march this year. Also reading and remembering will be Vasudha Harte, Riddhi, Frank Khouri, Willie McElroy and Robert Gibson. Other writers to keep an eye out for include Emily Bitto, winner of the latest Stella Prize, James Bradley (http://cityoftongues.com/), Jane Caro, Matthew Condon, Robert Drewe. Ramona Koval, Sofie Laguna, winner of this years Miles Franklin, Angelo Loukakis. Moya Sayer-Jones and many many more. The Arakwal Bumberlinpeope gathered for thousands of years on the land we now call Byron Bay to tell their stories and sing their ceremonies. If think of the Byron Bay Writers Festival of existing in such a tradition then it becomes much older than the 19 years of the current festival. Lets see this gathering of writers and creativity in a much larger and longer tradition in the Northern Rivers and maybe we can build some links to the ancient stories in this land. Rochford Street Review wishes everyone taking part a happy 2015 Festival! This entry was posted in Byron Bay Wrtiers Festival, Issue 15, Mark Roberts and tagged Byron Bay, Chigozie Obioma, Chris Flynn, Daevid Allen, David Hallett, Ellen van Neerven, Frank O’Hara, Jennifer Clement, Kate Grenville, Krissy Kneen, Lian Hearn, Mandy Nolan, Mark Dapin, Moya Sayer-Jones, One Life: My Mother’s Story, Sharon Olds, Tariq Ali, Zanni Louise, Zohab Zee Khan by Mark Roberts. Bookmark the permalink. Spinifex debut novelist Emma Ashmere is there too, talking about her wonderful novel, The Floating Garden. Did you know about the urban clearances in Sydney when the harbour bridge was built. This novel tells that story – and more.